If you haven't got a 4WD, one of the down sides of using a fishing torpedo is getting all the gear to the launch point. This also happens where vehicular access is limited or non-existent. 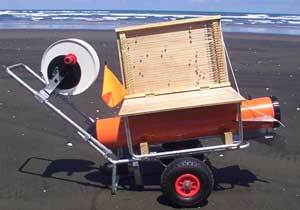 Graeme Trim of Challenger Marine Ltd in Auckland has designed an innovative beach cart to overcome the hassle. Graeme's cart is a well thought out bit of kit that has a 'place for everything and everything in its place'. In 'transport' mode the cart can be fitted into the back of a medium sized hatchback or four wheel drive by simply removing the handle. The Fishing torpedo sits snugly down the middle of the carts frame, keeping the weight and thus the centre of gravity low. This reduces the risk of the beach cart rolling over when negotiating a slope. The reel slots into the top of the cart, as does a combination bait and trace board. On top of the board is a space where anglers can carry a chilly bin (cooler bins of up to 55 litres in size). The two wheeled beach cart has large (10 inch) tyres make pulling the beach cart through soft sand a reasonably easy task. When at the launch site the bait/trace board unclips and become self standing. The reel also unclips from the cart and slots into the trolley handle. When setting or retrieving the line, a foot at the bottom of the beach cart digs into the sand to provide a base that is much more stable to wind against that the traditional beach spike. The bait/clip board folds out to access the traces/cutting surface. When closed up it doubles as a beach seat - clever eh! While the prototype cart we tested at Waipu Cove recently was only painted, the production models will be galvanised and powder coated to reduce corrosion. I take my hat off the Graeme's inventiveness. 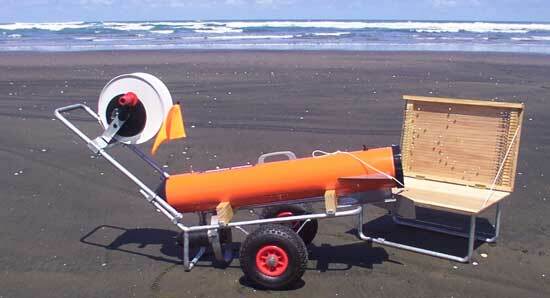 This versatile beach cart makes electric kontiki fishing an easy operation. The well balanced fishing cart is both compact and multi-functional and I am sure it is going to prove popular with users of Fishing Torpedoes throughout the country.